Mark Benston Jr. pulls ahead in a race against Ronnie Pace on Wednesday, Aug. 29. In an article last week, we met drag racer Mark Benston Jr., his father Mark Benston Sr. (who were misnamed last week), and North Star Racing co-owner Harry “Buck” Jarvis at their Dagsboro shop. In that shop, Mark Benston Jr. and his father were repairing and rebuilding a motor the son blew two weeks earlier at Capitol Raceway in Crofton, Md. Benston’s motor blew after he set a new personal run record pass of 3.96 seconds, reaching 197 mph. We met up with them again last Wednesday, Aug. 29, at U.S. 13 Dragway in Delmar, where they were seeking redemption from the Discovery Channel’s Street Outlaw Racers, who returned to Delaware to take on the BOYZ of the 302Nation in an Outlaw Street Race before the home crowd. Back in May, the Street Outlaws came east to U.S. 13 Dragway for some of the early season’s best door-to-door heads up, no-time racing, which resulted in Mark Benston Jr. ending up just inches from a $25,000 purse in the “Brawl for it All,” and local Steve Drummond failed to make it a sweep of the 302 finals. Drag racers call them Outlaw Street Racing for a reason. Two differences separate Outlaw Street Racing from regular drag racing: First, street racers prefer a “no-prep rule.” Second, electronic digital transponder results are not revealed to racers nor crews. Just like drag races on rural roads are settled, wins are decided visually. Another similarity to live street racing is the “no-prep” rule. Most drag strips pour chemicals — known as “prep,” on the surface of their concrete pads. They then run over it with a tractor towing three tires to soften the concrete, and mix the compound into a surface, forming a 1/8-inch-thick rubber cushion to launch from. Outlaw Street racers prefer racing on a “no-prepped” surface, which doesn’t necessarily mean virgin concrete, but a surface that wasn’t prepped on race day. That makes for a surface that’s more like the asphalt of a rural road than a racetrack. While some racers see the “no-prep” rule as leveling the playing field, others view “no-prep” racing as a recipe for disaster. And that’s the way Outlaw Street racers like it. Four Discovery Channel Outlaw Street Racers made the easterly tow to Delmar. Ronnie “Barefoot Racer” Pace towed his silver Chevy Camaro from Texas. One of the show’s most recognized racers, “Doc” was there piloting his famous 900-cubic-inch big-block 1970 Monte Carlo named “Street Beast.” Also there from the Discovery Channel’s Street Outlaws were Barry “The Godfather” Nicholson and Shawn “The Mistress” Wilhoit. There to face the Discovery Channel Street Outlaws from the local 302Nation were team North Star Racing’s Mark Benston Jr. and Dale Collins. Also representing 302Nation were local standouts Steve Drummond and Wayne Patton. “We’re here to put on a show. Win or lose, it’s fun. Of course, everybody likes to win,” Jarvis explained. Competing against professional drag racers requires teamwork, and the father/son relationship between Mark Benston Jr. and Mark Benston Sr. makes them hard to beat. It was that father/son teamwork that helped Mark Benston Jr. earn a trio of wins that night. The U.S. 13 Dragway has a full schedule well into the fall, starting with the 12th Annual Fast Fords on Sunday, Sept. 9. 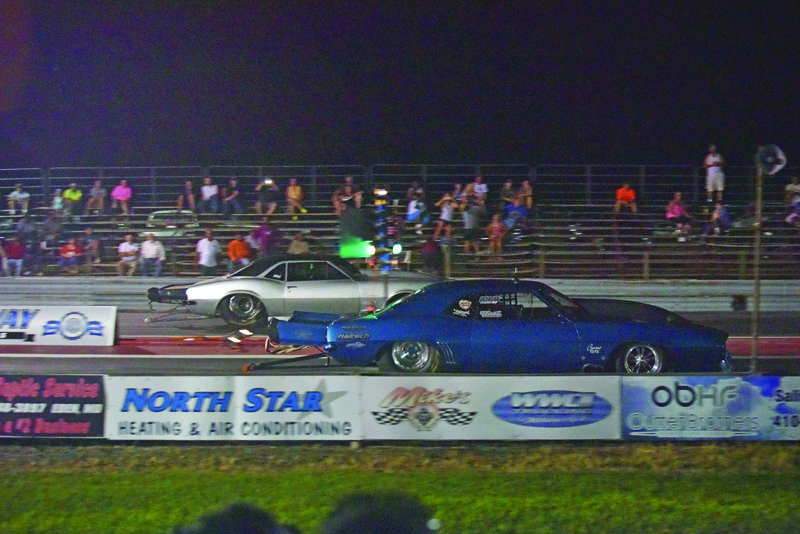 Then on Saturday, Sept. 15, the dragway will host the 4th Annual Grudge Nationals.